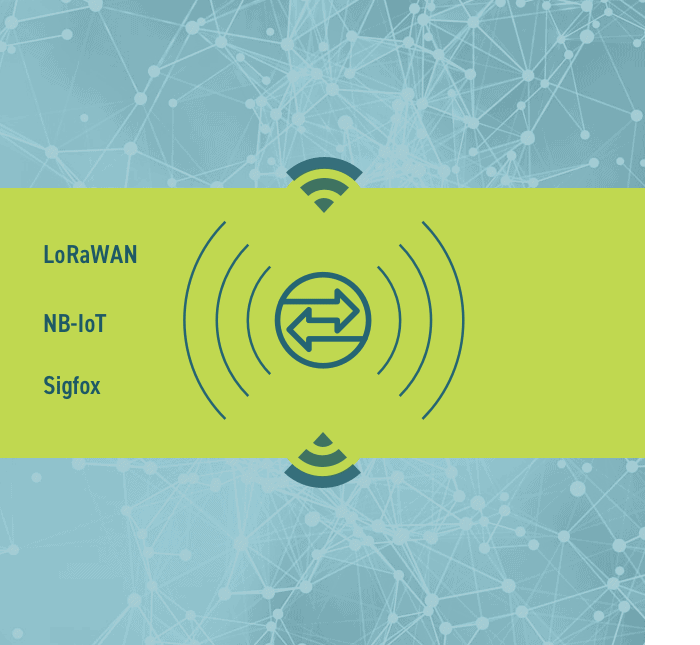 Build the next generation of IoT applications for your customers with LPWAN technologies. System integrators, system houses, and startups bring new IoT innovations into their own applications or applications developed for customers. This is accomplished with the help of SmartMakers thingsHUB and a wide range of plug & data sensors. SPEED UP THE DIGITAL TRANSFORMATION OF YOUR CUSTOMERS. Connect your machines to utilize directly applicable real-time information to optimize performance and ensure the best maintenance cycles. Save the laying of cables with battery-powered LoRaWAN sensors. Optimize production and avoid expensive downtime by using real-time data across the entire value chain. With NB-IoT, your system receives the decisive information even across multiple plant locations and national borders. Improve productivity with networked machinery. LoRaWAN ensures that you know the vital data of your systems. This allows you to act instead of being surprised. The transport system is going undergoing a process of radical change. In order to keep up the pace, data must be reliably delivered to telematics and logistics systems. NB-IoT is the right choice when it comes to monitoring the movements on the roads of this world. It doesn’t need infinite space to lose track. Optimize production processes, avoid long search times and ensure more security in your company. In intralogistics, systems are usually required that can transmit data via several channels, enabling workpieces to transmit their status from the high-bay warehouse or from the outside area of the plant site. An important component to meet these requirements is LoRaWAN. When transporting industrial gases and liquids in tanks, IoT technologies can be used to permanently monitor levels, pressure, and temperature. Containers transmit all opening and closing processes. The GPS position of the goods can also be determined at any time – whether on the road or on the rail. With NB-IoT you have everything under control. From the loading to the delivery. For sustainable management, the consumption of gas, water and electricity must be recorded transparently. With LoRaWAN you link all energy-relevant areas for a holistic analysis. The sensor is always at the very beginning of an alarm chain. The security centimetersfrom a well-rehearsed alarm chain. Redundantly designed LoRaWAN systems can contribute significantly to this. Sensor technology can be used in a wide variety of applications within buildings. Is the humidity in the canteen too high, are meeting rooms occupied and is the CO2 level in the office still within a normal range? 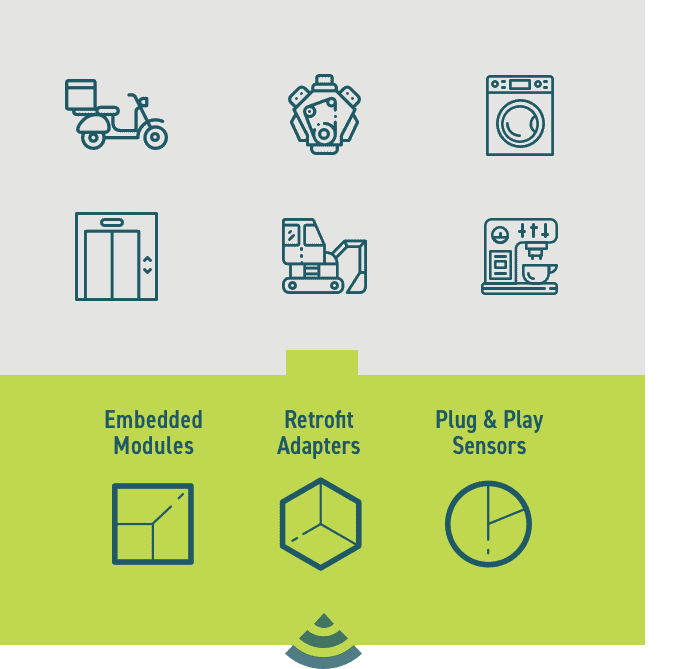 If you are looking for an answer to these questions, LoRaWAN sensors will quickly provide you with an answer. Whether it is your own or borrowed machines, LPWAN makes the use of the devices transparent and thus enables the exact determination of utilization data and the associated costs. With NB-IoT you save the temporary installation on the construction site. On a construction site, enormous assets often are in open fields without protection. These must be protected with clever systems that cannot be tricked out by bridging a wire. An LPWAN-based radio solution makes life difficult for thieves and ensures that the site manager can sleep peacefully. At the right time in the right place and most things are rarely in one place for a long time. For this reason, construction companies have always been among those who adopted new M2M tracking systems early – often at very high prices. Take your construction site logistics to the next level and reduce your costs: with NB-IoT. Beverages and foods are precious goods that need to be treated with care. Such simple things as monitoring the storage temperature contribute to a constantly high quality of the goods. With a monitoring solution based on LoRaWAN, you achieve a high-quality standard that pays off. The further development of the buying experience is determined by innovation such as immediate availability, personalization, and increasingly higher product quality standards. 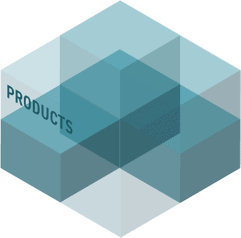 Products that know where they stand, shopping carts that tell where they move or guidance systems that guide customers directly to their favorite product optimize the shopping experience and are no longer just a vision with LoRaWAN technology. A wide variety of large appliances are in use in the retail trade, such as freezers, air conditioning systems or conveyor systems at cash registers. 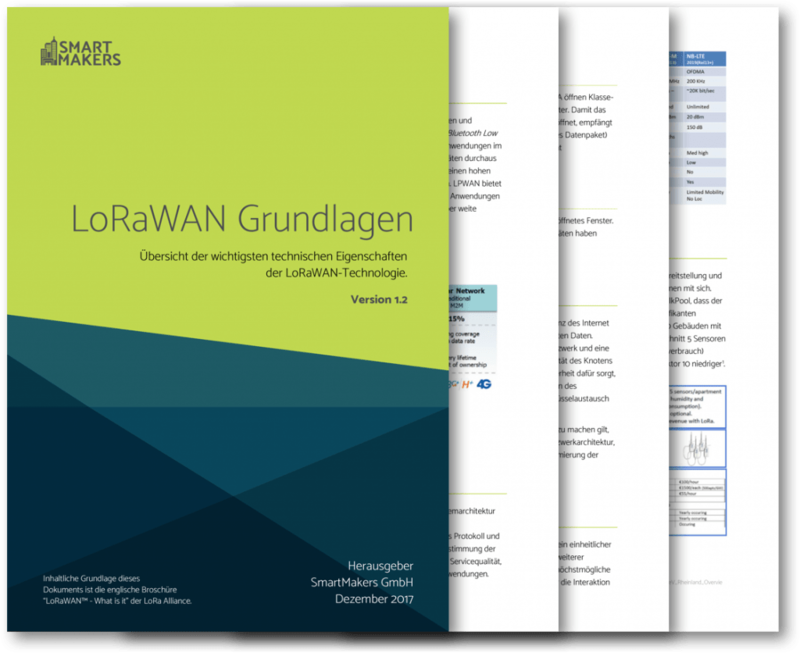 By using LoRaWAN, failures can be quickly detected and shutdown measures initiated. Combine sensor data with good analysis to optimize water consumption and improve the yield of plants. With NB-IoT you get the necessary data into your farm management system even in remote regions. Vital data of the livestock in real time ensuring that diseases can be detected early. LoRaWAN allows more flexible working hours and improves animal welfare and health. It’s not just the meter that counts on the field, but centimeter. In the field, you also have to be able to concentrate on the essentials in order to achieve the optimum result. NB-IoT ensures that the data connection works just as reliably as the farmer himself. With transparent energy consumption, you can optimize distribution networks, reduce operating costs and improve customer service. With a highly scalable LoRaWAN, with LoRaWAN adapters for existing devices and fully integrated LoRaWAN meters for new installations, cross-functional remote reading becomes a matter of course. Monitor your infrastructure, reduce downtimes and optimize the operation of your networks even in areas where there was no process data available in the control center. 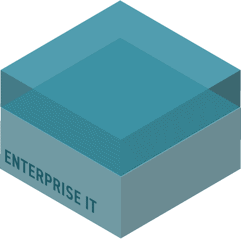 Our product LoRizont keeps everything broad to complete the image of your infrastructure. Smart parking sensors and good interconnected control systems reduce traffic and make our cities even more livable. Parking sensors with LoRaWAN enable a fast deployment of the infrastructure without transforming the entire city into a construction site. Reduce costs and make the city safer with a clever lighting control system. With LoRaWAN you can easily integrate and uniformly control both new and existing lanterns. The Internet of Things (IoT) requires high efficiency and flexible scalability of the communication. LPWAN meets both requirements: excellent range, high penetration, and long battery life at the lowest cost for components (chips/radio modules) or data transmission (connectivity). Various technologies have established their position in the market in recent years: LoRaWAN, Sigfox, and NB-IoT. What all IoT applications have in common is that data is transferred from many devices to further processing systems. 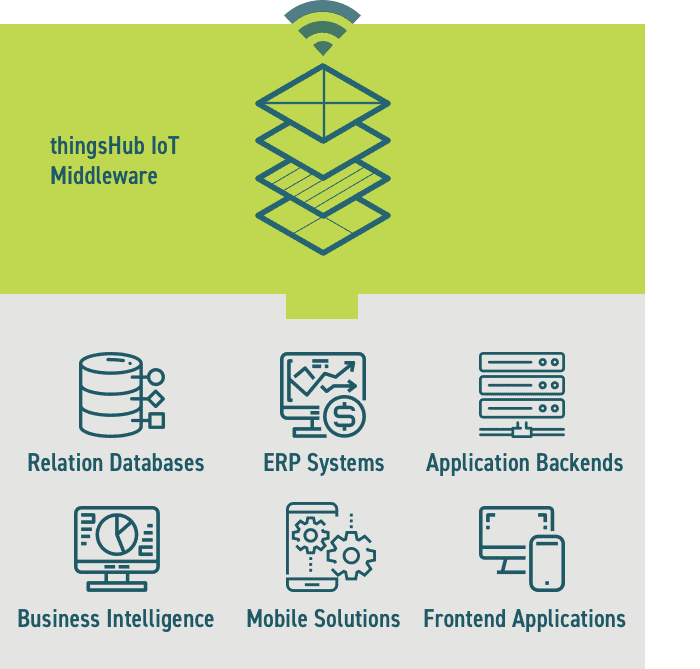 We have developed the thingsHub IoT middleware so that you do not have to deal with the question of how the data gets into your system to achieve added value: thingsHub supports you in launching and operating large IoT applications. It is the critical IT component that enables rapid integration of IoT sensor data into established business applications or IoT platforms. thingsHub is the unrivaled slingshot that accelerates the implementation of sensor data transfer in your system landscape. YOU WANT TO KNOW MORE ABOUT LPWAN TECHNOLOGIES AND THEIR APPLICATIONS? Build your own, city-wide or application-specific IoT network and reduce operating costs to a minimum. Reduces costs in three dimensions: Infrastructure investments, operating costs and end node sensors. The protocol was specially developed for low power consumption and allows battery-powered sensors to be used with only one charge for up to 10 years. A single base station provides deep penetration in dense urban/indoor areas and connects rural areas at a distance of up to 25 km. Supports millions of messages per base station. Perfect for public network operators serving many customers. Receive and send data to your global IoT devices over a wireless network designed specifically for the Internet of Things. NB-IoT offers good network coverage in difficult environments that are ideally suited for LPWA applications. 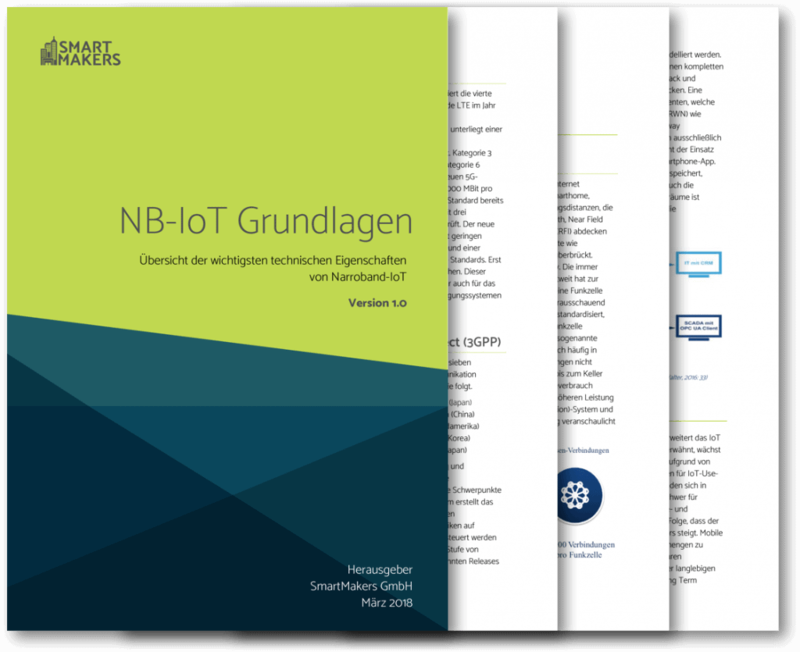 There are no legal restrictions for NB-IoT, e.g. how often each device may transmit data (duty cycle). NB-IoT is designed to minimize hardware costs. This is true both for the cost of the chips and for the cost of the antennas and sensors. Enables GPS-free tracking applications with low power consumption.